Hey there Terriers – hope you’re enjoying all the new activity on our exciting student blog. We’ve got a great group working in our office this summer and I happen to be one of them! Since I was a wee freshman I’ve worked in DOS and now somehow three years zipped by and I’m a senior studying public relations at our beloved university. There’s a lot of things I’d like you to know about me, but do you really care? Check me out here (or here) if you’d like. 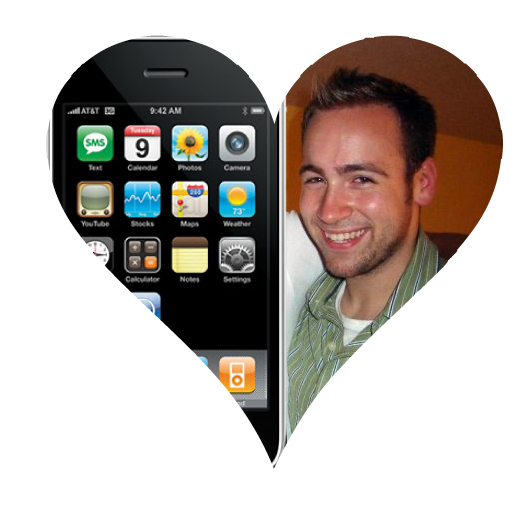 The one thing that is important is I have an incessant love of all things technological, especially my beloved iPhone. Apple is frequently the cause of my empty wallet and surely will be again as soon as I save up enough for the iPhone 4. You know what else I love? BU. I’m not just saying that because I work here – I honestly mean it. I should be on a steady diet of antidepressants just to deal with the thought that I’ll graduate this coming May. It’s tough to deal with – believe me! You know what has both iPhone tech and a lot of BU in it? The (relatively) new iPhone app. BU’s mobile addition came out earlier this year, bringing all the joy of visiting a BU website to your palm. Wait what’s that? The joy of a BU website? We’ll get to (the lack of that) later. On the surface, BU’s mobile app is sleek and friendly – six neat icons you can move around and place on separate pages, similar to the iPhone itself. Overall, each of these works well. You can read BU Today articles, check where the nearest bus stop or bike rack is, find out what’s going on at BU tonight, check out what courses your school has or even look up your professor’s email address when it’s midnight and you know that paper isn’t going to be done tomorrow. It’s a nice app – a good app. A decent attempt at creating a mobile window into BU. But let’s go back to that whole “reason BU students go to BU websites.” We want to charge convenience points or plan our schedule. We’d like to get some fast cash with a quickie job and how fast we’re going to have to run to catch the BUS. So while this is a good way to find where the Kenmore Classroom Building is (it could find it when Google Maps couldn’t! ), it could use a little shape up before us students get excited about it. Let’s have an app that allows us to pick classes, look at professor reviews, find out what’s for dinner at Shelton Hall. An app that caters to our needs – one that’s available on every mobile platform and puts the power of the Student Link in our palm. What do you think Terriers? Is the iPhone app bomb or bust? (wait, or are those both bad?) Or could you care less whether you have BU in your palm? Let us know below! Great blog! Very informational. First, I would like to start off by saying that I love this app, and I love the IPHONE! (I have neither, but hopefully someday I will!). I think this app is a great addition to any iphone app collector(that should be shortened into something hip and trendy: my proposal: Applector). The only problems I can see are the ones that Alex said: I want to be able to charge ridiculous amounts of monopoly-like money at any time from my Iphone. I have been caught so many times without money in the GSU and have to go downstairs to the basement and add it on the computers. Also, for those random times when I sit in class and think “How did I signup for this class!”, I wish I had the ability to look at professor reviews instantly from my BU app! It is definitely a “decent” attempt, but I look forward to an app with better features geared more towards my needs! The app is a nice attempt, but I can’t imagine opening it once the novelty is gone. Now, the independent BUS app – that was something I used daily. I’m aware BU pulled it from iTunes because of copyright issues, which I’m not going to bust BU for doing. However, it’s extremely easy to use, and was so much easier than having to drag up the PDF and pinching and pulling to find the next time from Agganis, and then forgetting if I was going inbound or outbound for the hundredth time. The schedule will change in the fall, so the app on my phone will simply act as a reminder of halcyon days gone by, but if BU could integrate a BUS schedule into the app- and not just the locations- this app would blow up. Once that schedule is in there, students would dig into everything else within the app.